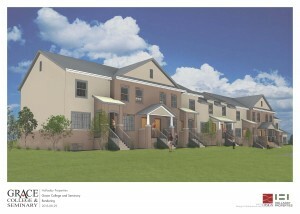 Proposed dorm at Grace College. A groundbreaking ceremony for the newest dorm at Grace College & Seminary, Winona Lake, Ind., will be held Thursday, October 31, at 1:00 p.m. The school’s record enrollments for the past several years have resulted in a need for more on-campus housing. After completing a new dorm last August, Grace is now ready to break ground on an 80-bed townhouse-style dorm that will be completed in time for students to move in August 2014. The dorm will be a three-story building located on the corner of Kings Highway and Seventh Street. It will feature brownstone facing, front and back porches, and an outdoor community space. Dr. Bill Katip, president of the college, will participate in the ceremony, along with Dr. James Custer, chairman of the board; Dr. Jim Swanson, vice president for academic and student services; Aaron Crabtree, dean of students; Bruce Shaffner, Winona Lake town council president; Grace student body president, Jackie Seal; future resident director of Lancer Lofts, Victoria Casey; Kevin Scully, partner at Design Collaborative; and Drew Mitchell and Larry Mudd, both vice presidents of development for Holladay Properties. The dorm is a project of Design Collaborative, the architect firm that designed the Lodge and the Manahan Orthopaedic Capital Center, and is developed by Holladay Properties, a South Bend, Indiana-based commercial real estate firm. Click here for photos of the new dorm’s location, floor plans, renderings and a construction schedule.